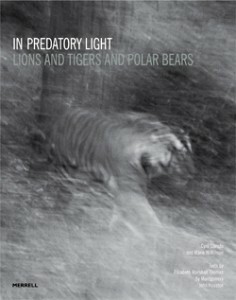 BOOKS: "IN PREDATORY LIGHT - Lions and Tigers and Polar Bears"
The photography and text filling the pages of In Predatory Light: Lions and Tigers and Polar Bears (Merrell, 2013) haunt like the dissolving edges of a gripping dream. This new book by art and conservation power couple Cyril Christo and Marie Wilkinson pays tribute to a shocking truth: On the cusps of this fragile planet, the great predators are dying. They take with them something so intrinsic to humanity we may not see it anymore. Today’s dominant Western society may have long ago dispensed with the animist beliefs of our ancestors, but the guardian spirits of our past still inhabit our deepest consciousness. We need “the others”, the four-footed ones, and the life force that they embody more than ever. Partners in life and in work, Christo and Wilkinson traveled to remote areas of the globe still inhabited by these endangered animals, capturing their presence in stunning black and white photography and incantatory prose. As in Rainer Maria Rilke’s 4th elegy: “And somewhere lions still roam, all unaware / In being magnificent, of any weakness.” This weakness is us, the human predator. This is a critical point in time to save them – or to witness their annihilation. In Predatory Light demands that we pay attention, not for the sake of the animals only, but for ourselves. We need them more than we know. In visiting these places, Christo and Wilkinson spent time with the indigenous peoples who have shared the land for millennia with these competing predators. They bring us the stories to which they listened, the stories we long for, illustrating “…the inexpressible bond between man and beast, the super-sensory realities that are still the hallmark of much that is most wondrous in life” (19). On a trip to the Kalahari in Botswana, Christo and Wilkinson stayed with a traditional hunter-gatherer community of Bushmen. There we were transfixed by tales of medicine men who climbed the threads to God’s village far above the earth, and at night we witnessed the famed trance dance, possibly the oldest human ritual on earth.